Too often when there’s a data panel at a music-industry conference, the conclusions are 1.) Music marketers are overrun with data in the era of social networks and streaming services, and 2.) That the challenge isn’t getting this data, but making sense of it. Both statements are true, but they are repeated so often they have become conference cliches. However, the data panel at the FastForward London conference this month tried to dig deeper to offer useful advice for music marketers. The panel included Síofra McComb, head of international sales and marketing at independent label !K7 Records; Samantha Mandel-Dallal, head of content insight at Spotify; Chloé Julien, CEO of analytics platform BandSquare; and Media Insight Consulting CEO (and FastForward founder) Chris Carey. The moderator was Music Ally’s Stuart Dredge. Here are some of the main talking points that came up during the session. A key theme running through the entire discussion was that data is limited if not properly assessed by humans. The power of a good analyst interpreting and contextualising data is what makes it valuable and useful. The human element: asking the right questions, putting them into context and thinking “beyond the numbers” is what identifies and explains trends, in other words. Want more data from fans? Just ask for it! Humans aren’t just important for analysing data, of course: they’re vital in generating it. For example, Julien said that in BandSquare’s experience, asking fans directly what they want is one of the most effective ways to correctly identify their willingness to pay. “Asking people questions about what they want is a much friendlier way of collecting data” she said, adding that fans are more willing to give information if they feel more in control of what data is being collected from them. Carey agreed. When asked about what the next trends and techniques in data analytics will be, he cited a “regression to the simplicity of just asking people questions”. Carey also returned to the element of human interaction with data, and the pitfalls that lie in wait. “Getting lost in the numbers is counterproductive” he added. Mandel-Dallal talked about how Spotify is digging into its own data to better understand music discovery patterns. “The team is working on better understanding what happens after getting added to a big playlist”, she said, with an emphasis on what happens after the initial spike in streams from this kind of event. 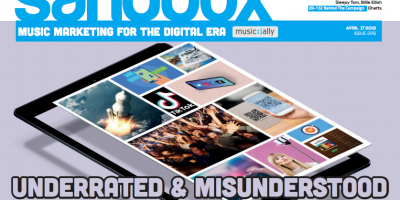 “We have been using data to see how artists have been breaking in the past,” she said – but now Spotify wants to see what’s next for those artists, as well as analysing the effect when an artist is added to the streaming service’s algorithmic playlists (like Discover Weekly and Release Radar) and then supporting those artists to take their next steps. BandSquare’s Julien raised this point in reference to artists who are using their analytics to pitch for brand partnerships, with the data key to showing those brands that their respective audiences overlap. “Data gives you a lot of power of negotiation as well, you can add value to your product and the brand that you are selling if you have the data to justify and back it up,” she said. “This particularly works in the context of sponsorships and partnerships”. Just as artists often need a certain amount of online buzz – streams, views, likes, shares – to be more attractive to labels, so that kind of engagement can help fuel their partnerships with brands too. McComb talked about the tools she uses on a day-to-day basis at !K7 Records, citing Chartmetric, Linkfire and the importance of tracking clickthroughs, as well as the analytics provided by the various streaming/social platforms. McComb expressed her belief in “using as much data as you can” but with defined objectives in mind. “What do you want to use it for? To build engagement, increase Facebook likes or YouTube retention?”. McComb reminded the audience that these are the kinds of objectives that should be defined before creating a campaign, let alone looking at its data. She also talked about the importance to “not only focus on sales, but also on the development of an artist thorough data” with an eye to the long term. Carey returned to a point he’s made on conference panels before: the dangers of assuming that analysing what happened in the past (using data) is always a reliable guide to what will happen in the future. He reminded the audience that it’s always important to evaluate data and look for any disconnects between the past, and what the future may bring. The panel also discussed how long data stays useful for, and how often marketers should be checking it. The consensus was that getting sucked in to real-time data feeds, or even checking every hour, can be more unproductive than not looking at data at all. An audience member asked whether data can help to answer the question about the relevance of the album format in 2017 and beyond. Carey was in no doubt: “The album is not dead. It still has a massive role to play”. Mandel-Dallal agreed. “Data can reveal some trend in the decline, however not so much as saying the album is dead,” she said. Even in a streaming era where healthy long-term plays are the main goal rather than just a first-week spike, some of the traditional data-points retain their usefulness. For example, first-week figures and chart positions help to drive live bookings and other parts of an artist’s business. The old thresholds for ‘success’ may seem to have been swept away, but smart artists and marketers understand that even some of those traditional metrics can be powerful when used for specific objectives.